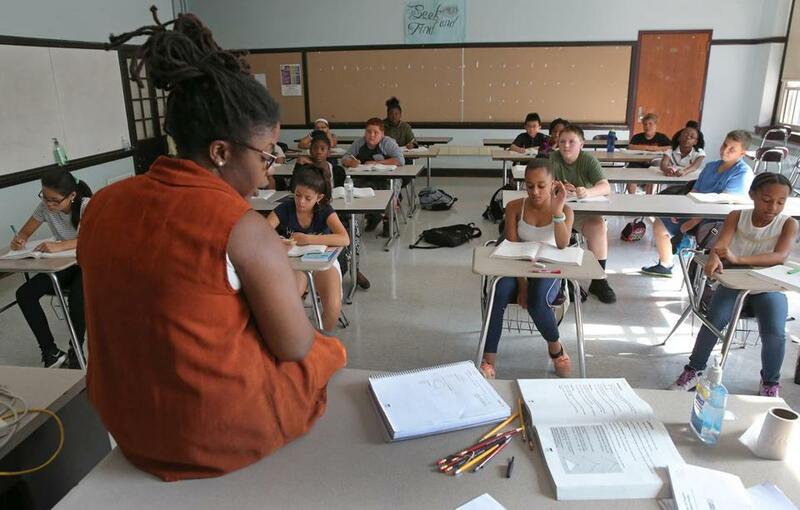 Gabriella Gilbert sits on a desk at Boston Latin School in August 2016, teaching a pre-algebra class. Yet another report shows that Boston Latin School, the historic crown jewel of public education in Boston, has a diversity problem. The city’s half-measures haven’t made much of a dent, and it’s time for Mayor Marty Walsh to show some political courage by allowing the school department to tackle the roots of the gap: the standardized test that forms the cornerstone of the exam-school admissions process. First, the problem: Right now, black students represent 8 percent of the student population at Boston Latin, while they account for 34 percent of the district’s student body at large; the corresponding figures for Latinos are 13 percent and 42 percent. Those numbers are embarrassing. Thus far, the city’s response to concerns about diversity has been to expand test-prep classes, providing students from disadvantaged backgrounds the same boost wealthy families often give their kids. But it’s the test itself — which, along with grades determines admissions — that appears to be the problem. The Independent School Entrance Examination covers material that’s not even included in the public school curriculum. Historically, just getting students from disadvantaged backgrounds to take the ISEE test has been a challenge. And, according to new Harvard research, even when high-achieving black and Latino kids take the exam, they do worse on the test than white and Asian kids with similar MCAS scores. In other words, kids may have similar academic performance up until the moment they take the ISEE, when their fates diverge by race. The Harvard report suggests that the MCAS, itself a rigorous test, would be a better admissions yardstick, resulting in an increase of combined black and Hispanic enrollment at Boston Latin from 21 percent to 30 percent, if all minority students offered admission accepted it. At the least, city leaders need to be willing to talk openly about such changes. In addition to the test, there are other constitutionally safe, pro-diversity admissions policies that could be implemented, such as giving more weight to socioeconomic status and guaranteeing seats in the three exams schools for every single public elementary and middle school in Boston. Change won’t be easy. Just ask the district’s former superintendent, Tommy Chang, who tried to overhaul admissions at exam schools, and even formed an advisory committee to make sure all kids had a fair shot at enrolling in the elite schools. But that move resulted in his first major political fight with Walsh, who nixed the effort after some parents revolted. New York City is also wrestling with changes to the admissions process to its selective high schools, which are also racially segregated. But officials there have a larger fight on their hands, in part because any changes would need approval from the state’s Legislature. Boston has no such barriers — and no such excuses. There are ways to make the admissions process fairer without sacrificing academic rigor. Walsh quashed the last discussion of systematic change at Boston Latin, and now he’s the one who needs to take a public lead making the city’s best school its fairest, too.